The Kennedy Center Mark Twain Prize for American Humor salutes David Letterman in a special recorded at the John F. Kennedy Center for the Performing Arts in October 2017. It features a star-studded cast of Letterman’s friends and colleagues including Jimmy Kimmel, Steve Martin, Bill Murray, Amy Schumer, Paul Shaffer, Martin Short, Eddie Vedder, and many other top entertainers and comedians. The evening pays tribute to the humor and accomplishments of the broadcasting icon. Born and raised in Indianapolis, David Letterman has been hailed as one of the most innovative and influential broadcasters in the history of television. 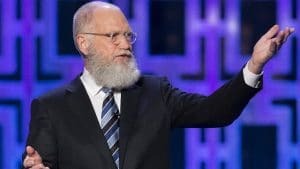 In 33 years on late-night television, Letterman hosted 6,028 episodes of Late Night (NBC) and The Late Show (CBS), surpassing his mentor, Johnny Carson, for the longest-running late-night broadcaster in American history. As a writer, producer, and performer, Letterman is one of the most-nominated people in Emmy Award history and a 10-time Emmy winner, as well as a Peabody Award winner. On CPTV: Monday, December 31, 2018 at 10 p.m.